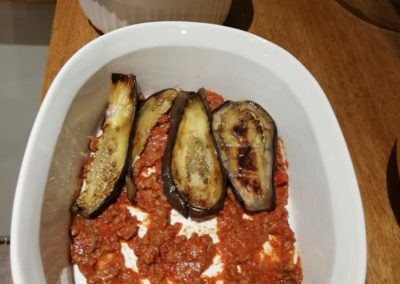 This was a really amazing recipe which is really simple to make. 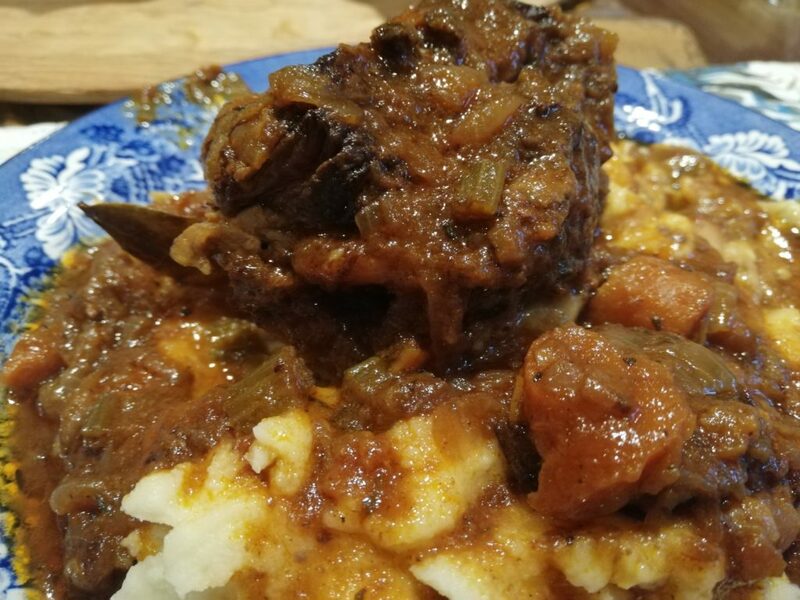 You do need to keep an eye on it to make sure that there is enough liquid to slowly braise the oxtail and make it fall off the bone tender. 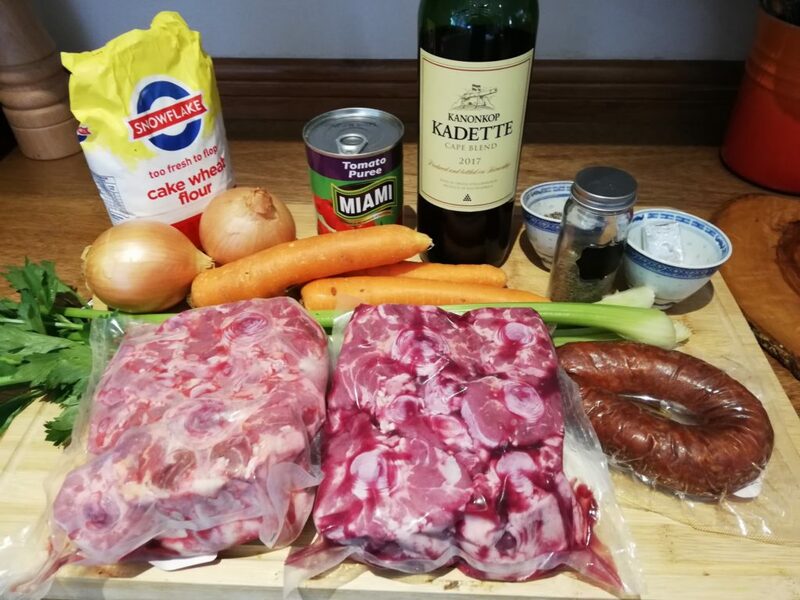 I am that bloke who buys great oxtail whenever I see it at a good price or where the oxtail is not too fatty and then waits for a cold weekend, or weekend away inDullstroom to make it. See the image gallery below for pics through the process. This recipe feeds about 8 people and has a little spice to it from the chorizo. 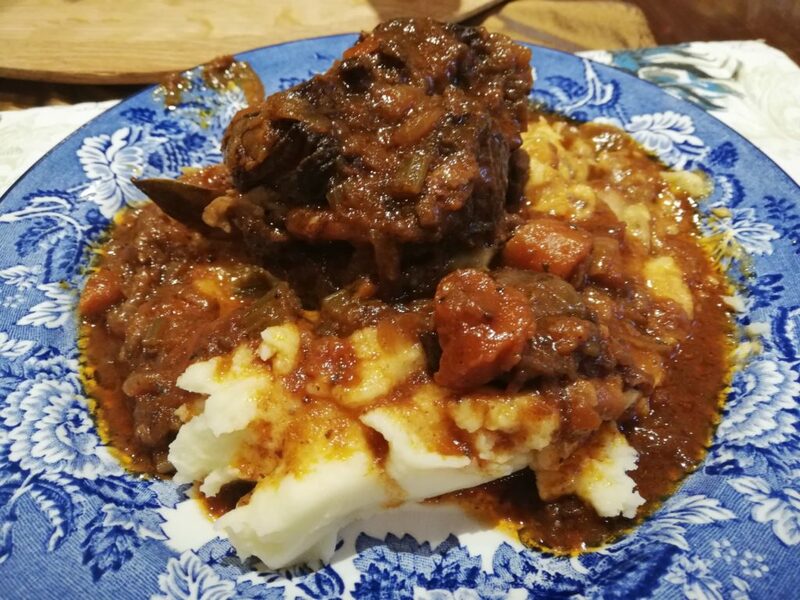 If you prefer a more traditional oxtail, use the following recipe. You can use the same recipe for a slow cooker version. 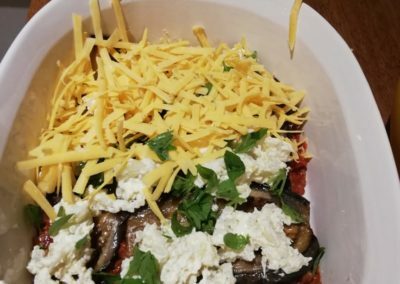 After you have cooked all of the ingredients, instead of putting into the oven, pour into your slow cooker. Put the slow cooker on high until the edges start to bubble and then set at low for about 6 hours. Heat your oven to 140 celsius and drop your racks to the bottom shelf. Season the oxtail with salt and pepper and brown in a hot cast iron pot with the oil for a few minutes. Add the flour, toss around until you have some nively browned edges and remove from the pot. 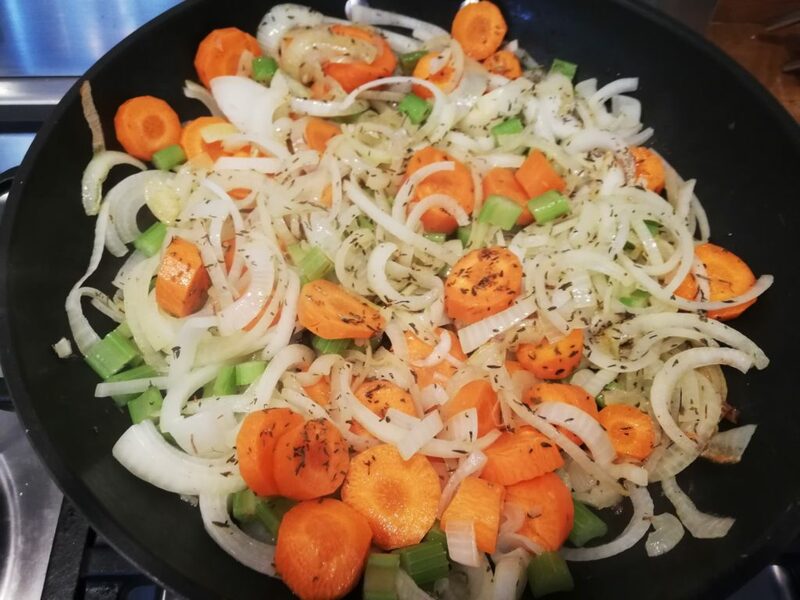 Reduce the heat to medium, add some more oil and cook the onions, carrots and celery for about 5 minutes, stirring from time to time until the onions are starting to brown. You should be getting some amazing smells from the pot about now. Add the thyme, about a teaspoon each of salt and pepper and cook for a further 2 minutes or so. Now add the tomato puree and cook for at least 5 minutes until the tomatop is hot and most of the bitterness from the tomatoes is gone. Add the cooked oxtail and the chorizo, stir about and then add the wine and stock. 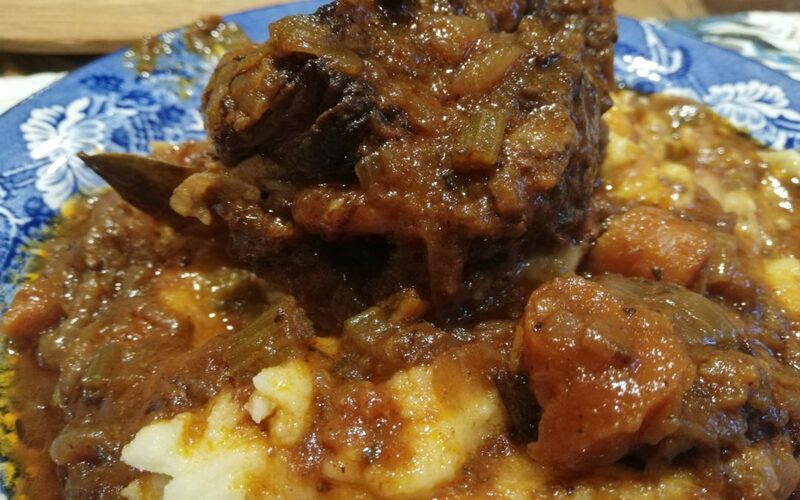 Be sure the oxtail is covered by the liquid. If it is not, add enough water to cover. 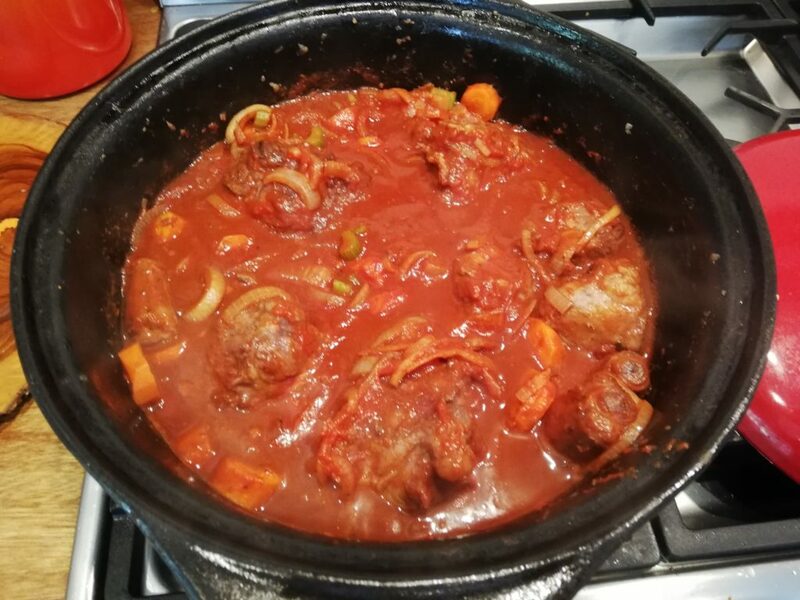 Now remove from the stoive, put the lid on and pop into the oven for 3-4 hours until the oxtail is beautifully soft and the sauce thick and delicious. Check every hour or so during the cooking process to check the liquid level and adjust the salt, pepper/wine if necessary. 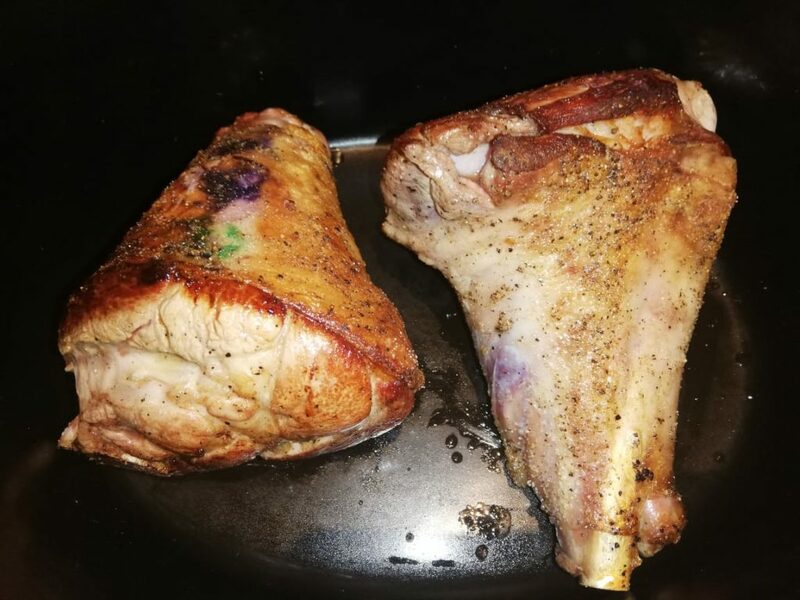 Super tender lamb shanks are a real treat and one of my absolute favorite meal. It does take some time and often like a good curry is bettyer the next day but not essential. 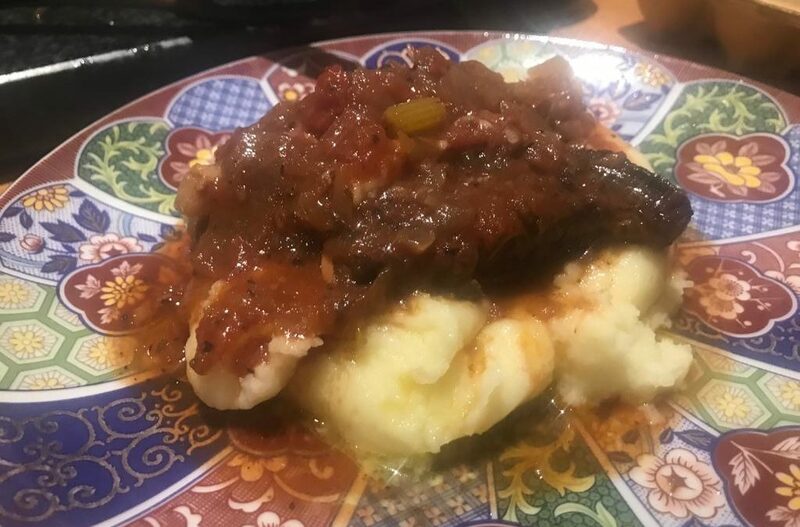 This recipe can be done in a slow cooker or in the oven in a nice large cast iron casserole dish but is really good in the slow cooker. 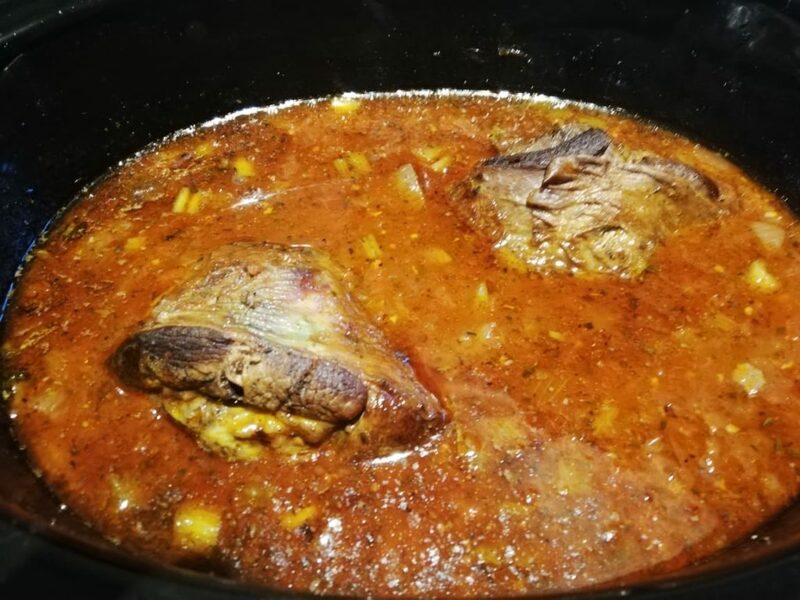 Slow cooker: Use the recipe as it is below for the slow cooker method. Picture gallery at the end of the recipe. This will easily feed 6 people with a little left over. Serve with a salad. Place about 2 tablespoons of oil in a large frying pan and brown the shanks which have been well seasoned with salt and pepper nicely. Remove and set aside. 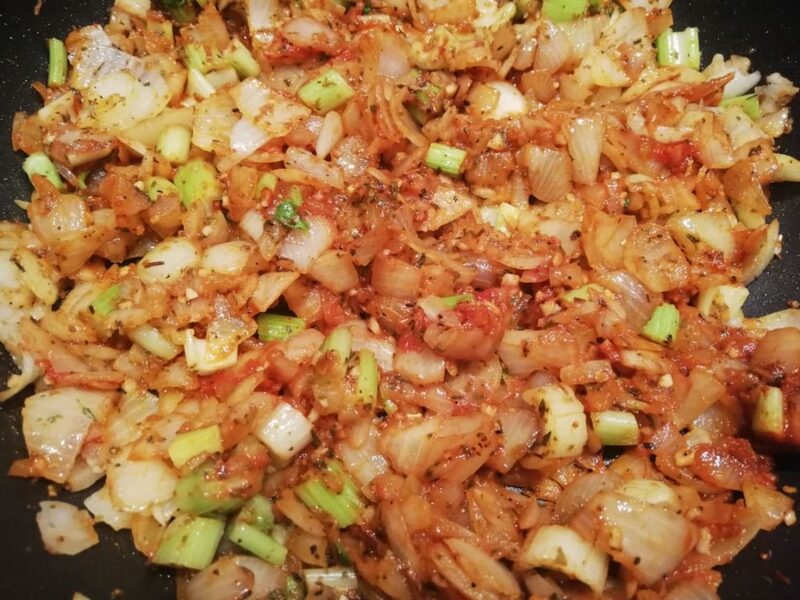 In the same frying pan on a medium to high heat and cook the onions, celery, herbs and garlic until the onions are translucent and starting to soften. Add the tomato paste, about 1 teaspoon of salt and half teaspoon black pepper and cook for another 5 minutes or so. Place the browned shanks in the slow cooker, cover with the onion mixture, add the wine and chicken stock and give it a stir. Place the lid on, set to high for 30 minutes and then reduce to low. Leave it be for 8-10 hours. Serve with mash and your favorite veg. Heat the oven to 150 degrees celsius. Place about 2 tablespoons of oil in cast iron casserole dish on the stove top and brown the shanks which have been well seasoned with salt and pepper nicely. Remove and set aside. Add the onions, celery, herbs and garlic and cook until the onions are translucent and starting to soften. Add the tomato paste and cook for another 5 minutes or so. Add the wine and chicken stock and place the shanks in the mixture. Place the casserole in the oven and let is cook with the lid on for 3-4 hours, checking the liquid level every hour or so. If it needs more liquid, add a little water or stock. After 4 hours check for the last time, turn off the oven and leave alone for another 2 hours. I started out this year a few kilo’s heavy after a fantastic holiday to Italy and Mozambique so came back ready to drop a few kgs. 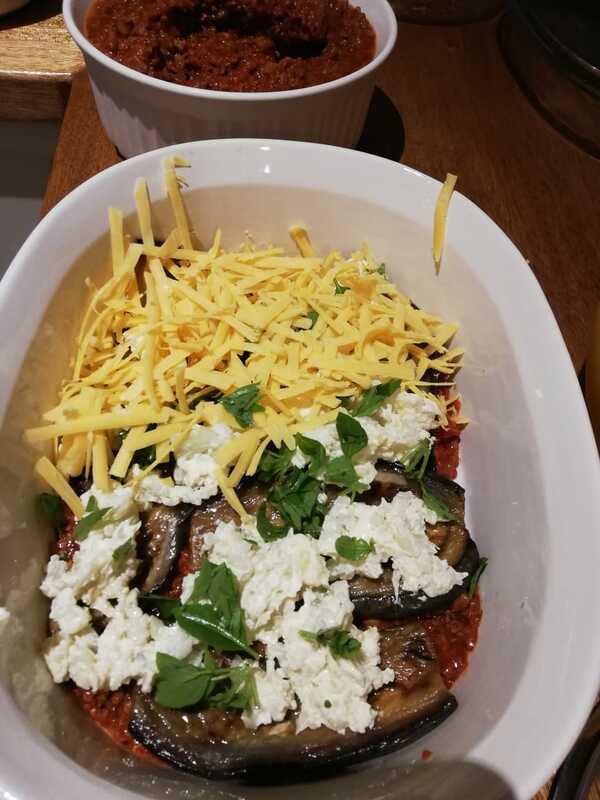 My girlfriend had been chatting about Keto and is pretty similar to banting which I have on good authority works. This started a great adventure in No carb, no sugar cooking and this take on Lasagna, which uses brinjal instead of pasta and cauliflower with cream cheese instead of white sauce is amazing. 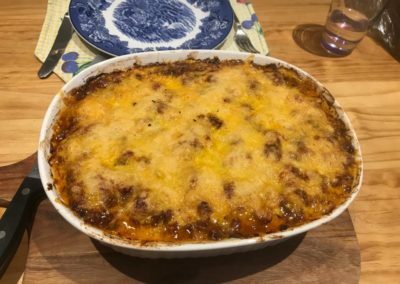 Give it a try, it is worth the effort 🙂 Picture gallery at the end of the recipe. Lots of cheese, mature cheddar or a mic of mature cheddar and cheddar. First, slice the bringals, place them on a baking sheet and sprinkle liberally with salt to extract the liquid. Leave them for about 30 minutes or so. Now make the bolognese sauce. Add the chopped onions to large pot and sweat on a medium to high heat. Add the garlic and mince and cook until lightly browned. Add the tomato paste and herbs and cook for a further 5 minutes or so. 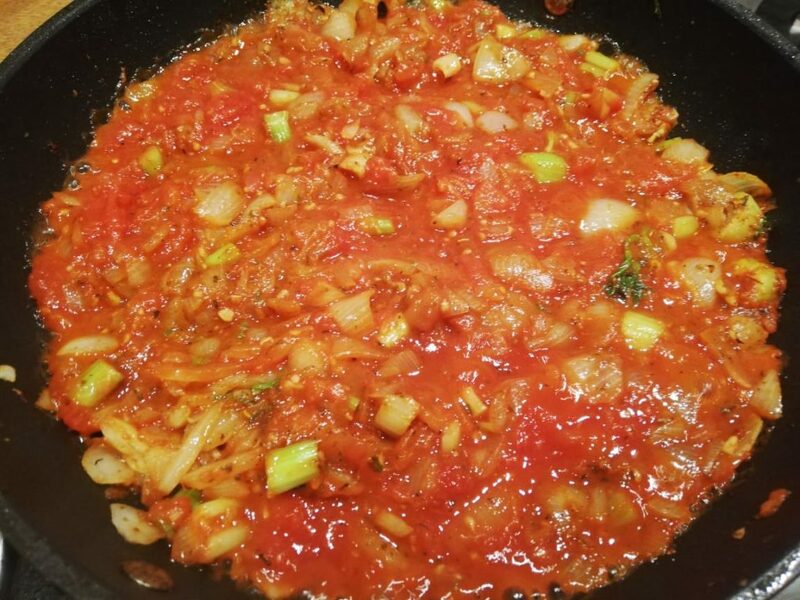 Now add the tinned tomatoes, season with salt and pepper, mix it up and leave to simmer on a low heat for as long as it takes to do the rest. Give it a stir every now and then. 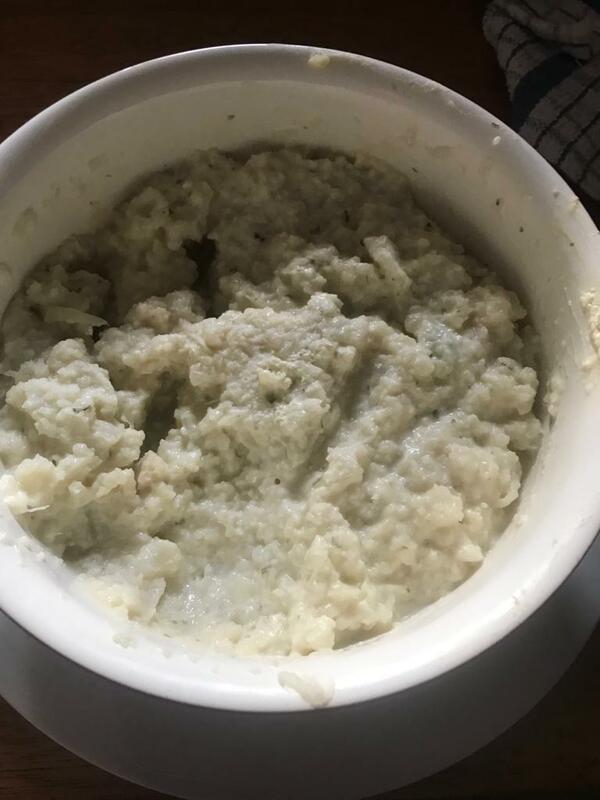 Now steam/boil the cauliflower until semi soft, remove from the heat, drain the water and mix in the cottage cheese and set aside. Next you want to take the brinjal that has been sweating and wash off any salt under cold water. Then place on kitchen towel to remove water. Put a pan on high heat on the stove and cook the brinjal in a little olive oil until soft and lightly browned. Once done, remove and set aside. 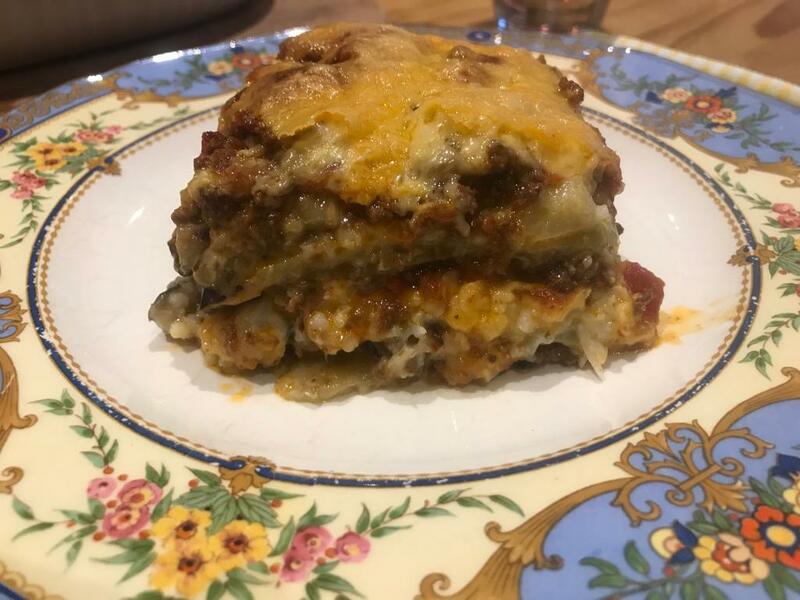 Construct the brinjal lasagna in a large oven proof dish by making alternate layers of bolognese, brinjal, cauliflower and cheese. 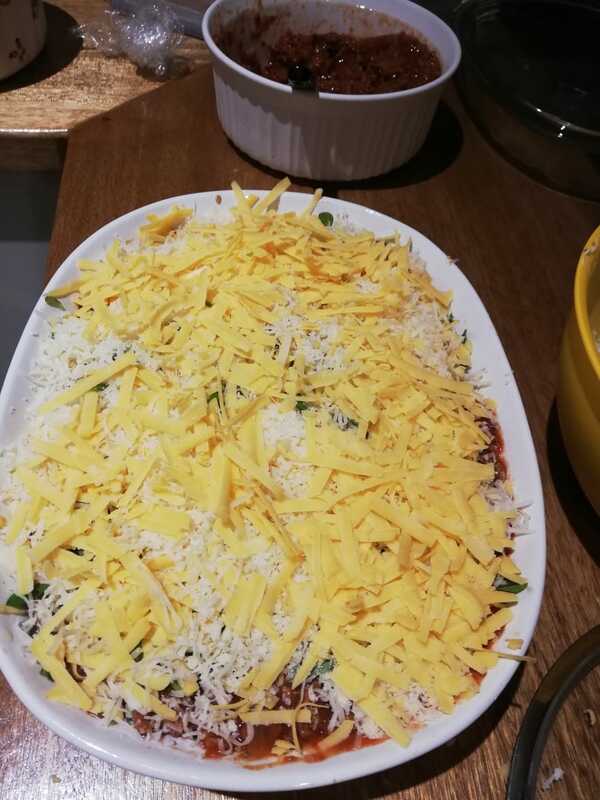 Finish off with bolognese and a layer of cheese. 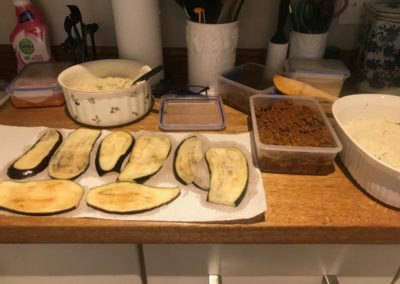 Place in a 180 celsius oven for about 30-40 minutes or until the top is browned and the juices from the bolognese sauce are bubbling up the sides. 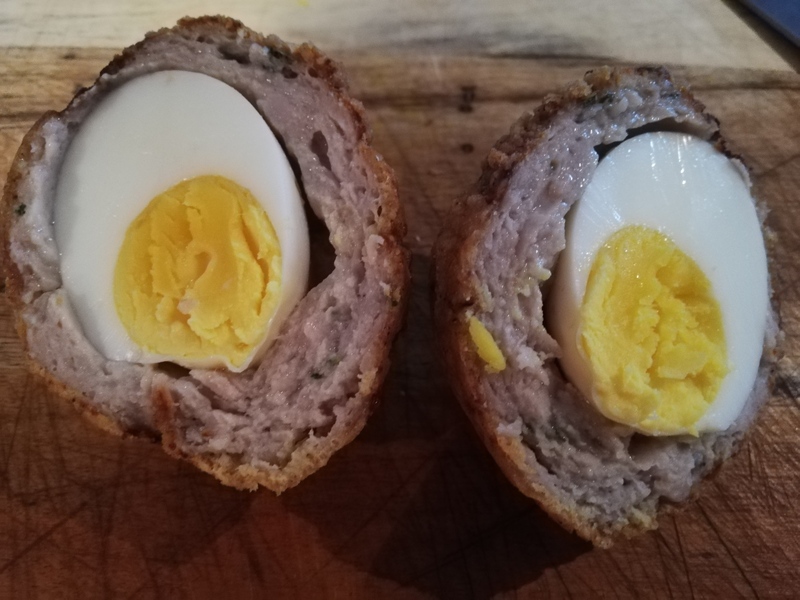 Scotch eggs are seriously good comfort food which I take to work with me, leave in the fridge for snacks and even have as a lunch with a nice green salad. They are not complicated to make but do use a bit of oil, take a little while and seem like a mission to make, which often puts people off. 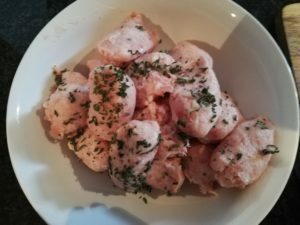 Just try it, you will be so pleased you did and there will be a few meals in the fridge! Remove all of the meat from the sausage casings and place into a bowl. Pleace about 500ml of oil in a pot on a medium to high heat and let it come to temperature. 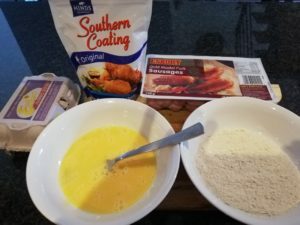 Beat 2 eggs in a shallow bowl and place the southern fried mix or breadcrumbs in another shallow bowl. 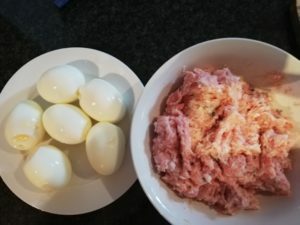 Now wet you hands, grab an egg and cover with about 1cm of sausage meat all around. 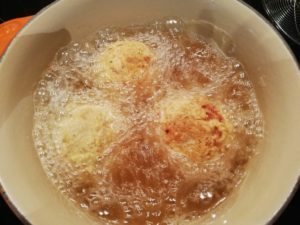 Dunk the covered egg into the egg and then into the bread crumbs/southern fried coating. repaet and then place into the hot oil. Allow to cook until golden brown. Remove from the oil and place on an absorbent paper towel. 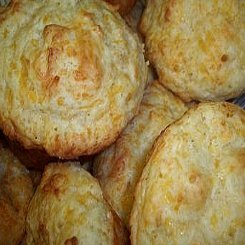 Any time is snack time and these very easy to make cheese muffins are musts to have around the house. 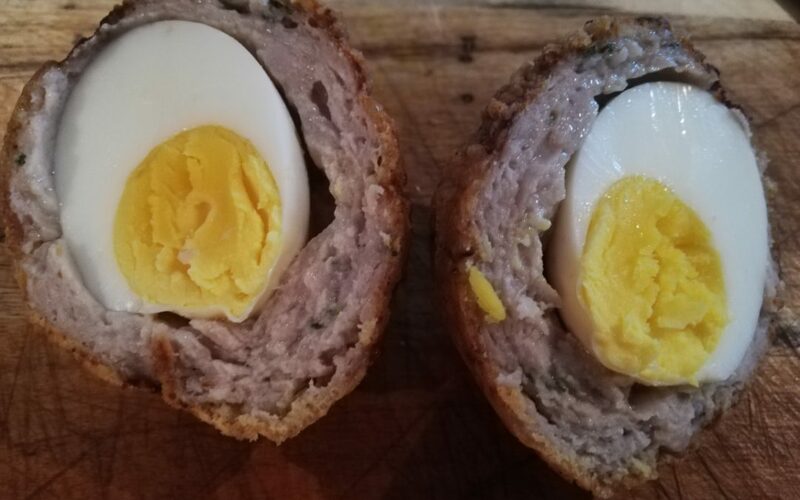 Pop one or two into lunch boxes for the kids, take a few to work and have them with cream cheese, add more cheese and perhaps some ham, these are great. Heat your oven to 190 Celsius and lightly butter a muffin tray. If you have cookie cups, insert a cookie cup into each space. In a large bowl, add all of the dry ingredients. Flour, sugar, baking powder and salt. In another bowl, add the egg and milk and whisk together well. Now add the melted butter and whisk to combine. 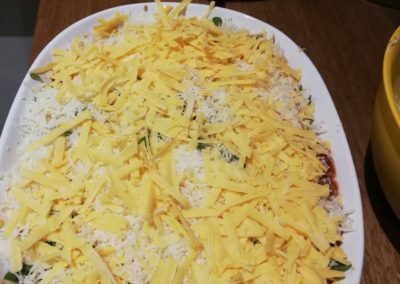 Add the egg mixture along with the cheese to the dry ingredients and stir together with a metal spoon until well combined. Spoon the mixture equally into the 12 spaces and bake for 20 to 25 minutes. Remove and allow to cool a little before digging in. Try the Apple cinnamon muffin recipe as well, you will love them. This is the easiest way to cook eisbein. It removes some of the fat, cooks it through and you have control over the crackling and the crackling is what it is all about after all 🙂 Ever since I had eisbein at a restaurant near the Randburg magistrates court, I have tried to get that same tenderness in the meat and the crisp crackling and think this eisbein recipe is pretty close. 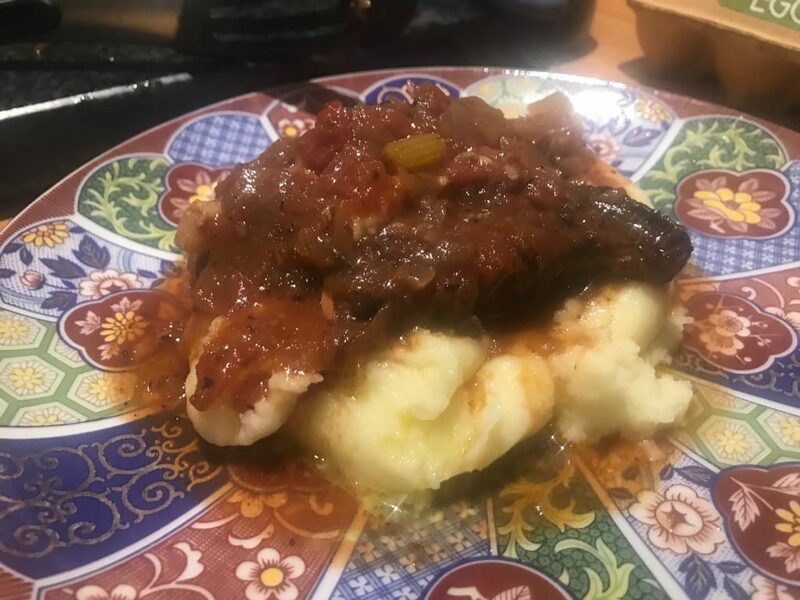 Update 2017: I have been eating a lot of pork the last year or so, tried many ways of cooking it and even tried jamie Olivers way of cooking pork belly, but there is nothing to beat a good eisbein. 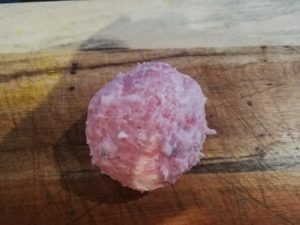 If you want to know how to cook eisbein, this is a tried and tested recipe that has been the winner every time. 🙂 enjoy it folks, until next time. 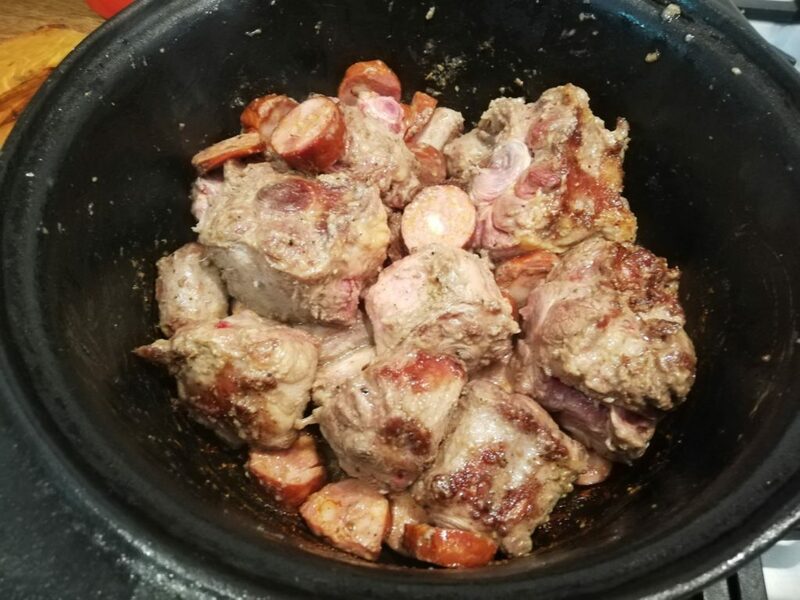 Place the pork shanks into a large pot, add all the rest of the ingredients and put in enough water to cover the pork shanks. Bring it to the boil and then reduce heat and allow it to simmer for about 1 and a half hours. The meat will be tender and the skins soft. Remove them from the pot and pat dry with a cloth, score the skin diagonally with a sharp knife and salt the skin well. Place under a hot grill allowing the skin to crisp up. Keep an eye on them and turn to crisp the entire outside. 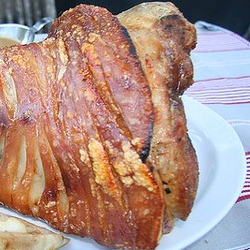 Best served with boiled potatoes tossed in butter and parsley with sauerkraut and strong mustard. Also put some apple puree on the table… you are going to love it. 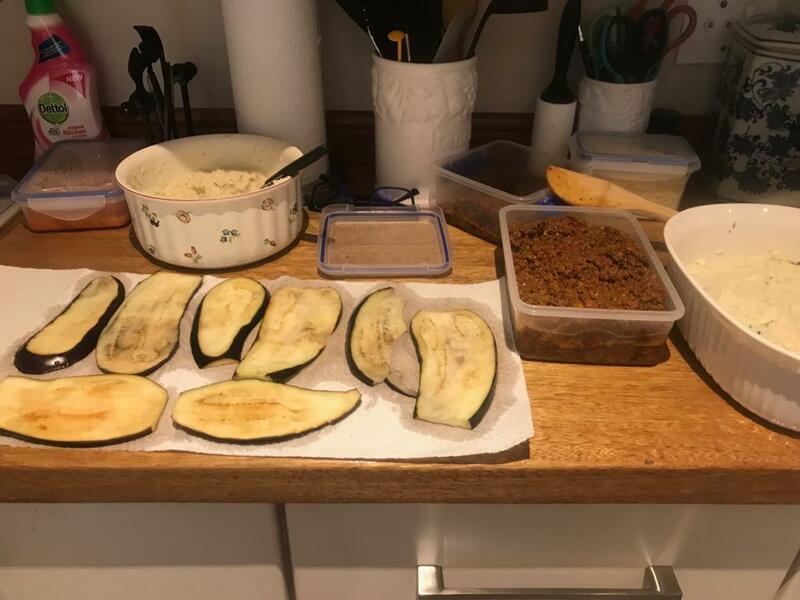 I had some left over penne from the night before and found a chorizo and some other goodies which I needed to use. I really love digging out what I have not used every few days and seeing what I can come up with, it doesn’t always work out as I expect but this one was a real winner. If you don’t have chorizo, use bacon or salami. This fed 3 very hungry people with a bit left over so 4 or 5 would be right. It took all of 15 minutes from start to finish. Chorico has a beautiful spicy paprika flavour that just puts this recipe in a whole dimension of it’s own. I make it regularly and love it every time. Slice the chicken breasts across the grain into fairly thin slices (3-4mm) and do the same with the chorizo. Season the chicken well with salt and pepper and sprinkle over the paprika. 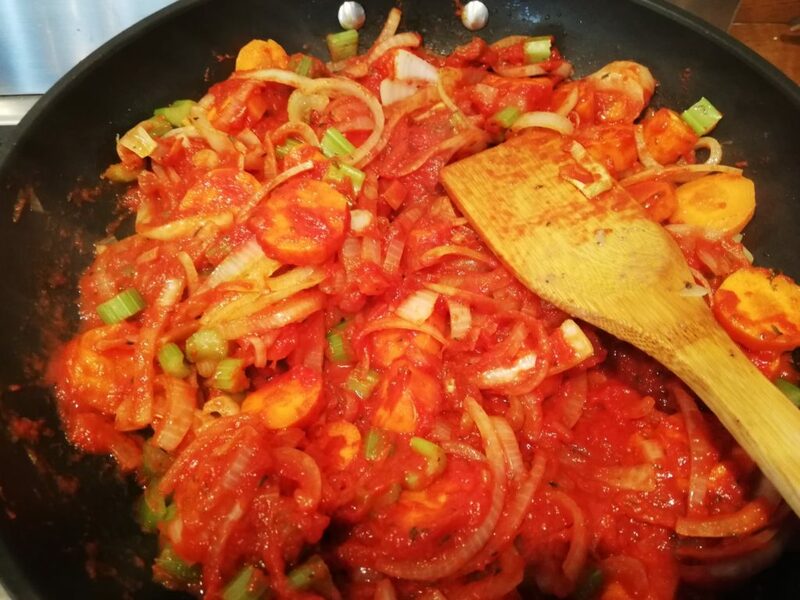 In a hot wok or deep frying pan with a little oil, add the onion, garlic, chicken and chorizo and cook for about 5 minutes stirring all the time. When the chicken takes on a whitish color add the tin of chopped tomatos, reducethe heat to low and simmer for about another 5 minutes, stirring occasionally. 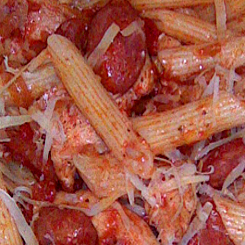 Toss the cooked penne into the pan or the mixture into the pasta pot and toss until the pasta is coated with sauce. You are done, enjoy. 2017 – I have really made this so often I have to remind you all. 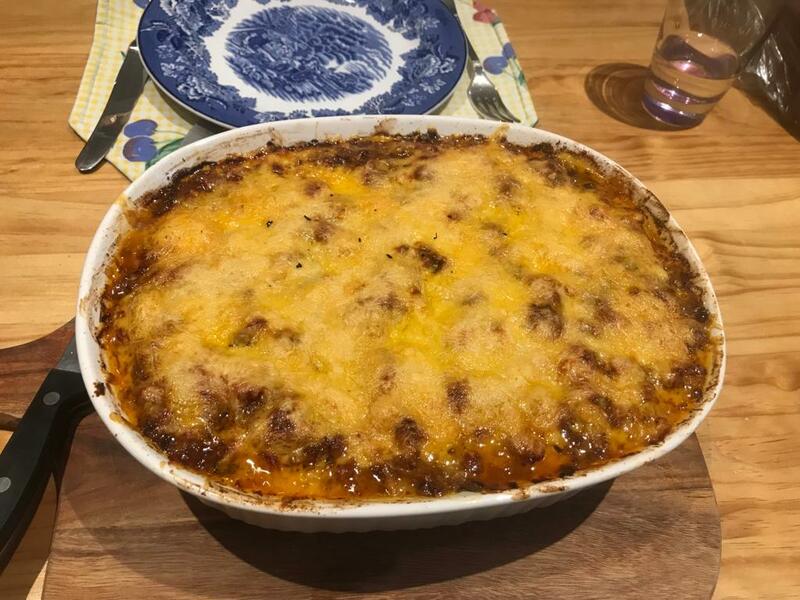 You can try different variations of this recipe using bacon instead of chorico and then adding a little smoked paprika or even adding some cream to the sauce just before serving and letting it heat up (well worth tring, it’s a winner for me). We had a Malva pudding for dessert and I still had a bit of Lemon meringue pie which did not last very long… what a treat and so little fuss. 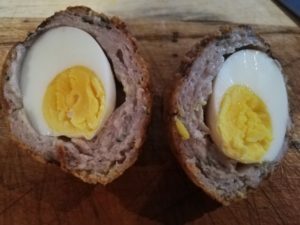 This is such an incredibly easy recipe it is almost hard to believe it tastes so fantastic. 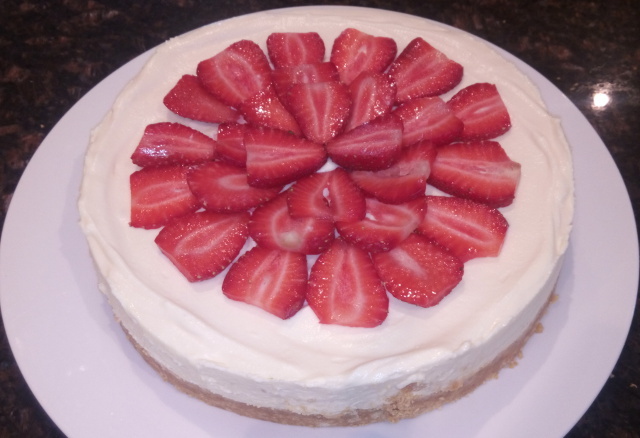 I am not a big fan of sweet cheesecake recipes and this one really is an excellent recipe. Next time I make this recipe I think I will add some finely grated citrus rind. I can taste a little lemon or orange zest in it but it is fantastic as it is as well. Because it is not overly sweet, top it with almost anything to sweeten it up. Any fruit or berries will do the trick or even some crushed oreos, roasted coconut or anything that you like. Break up the biscuits, place them in a food processor and blend until a they are fine crumbs. Melt the butter in a bowl, add the fine biscuit mixture and mix well until fully combined. Take your baking tin and spray with spray and cook, then line the base of the tin with the biscuit mixture. press it down quite firmly with the base of a spoon and check that you have it fairly even by measuring with the spoon against the side of the dish all the way round. Place the tin in the fridge. Heat the 50ml of cream on medium heat until warm but not boiling, remove from the heat and add the chopped white chocolate. Stir until it is completely melted. Add the melted chocolate and the vanilla essence to the cream mixture and fold in with a spatula. 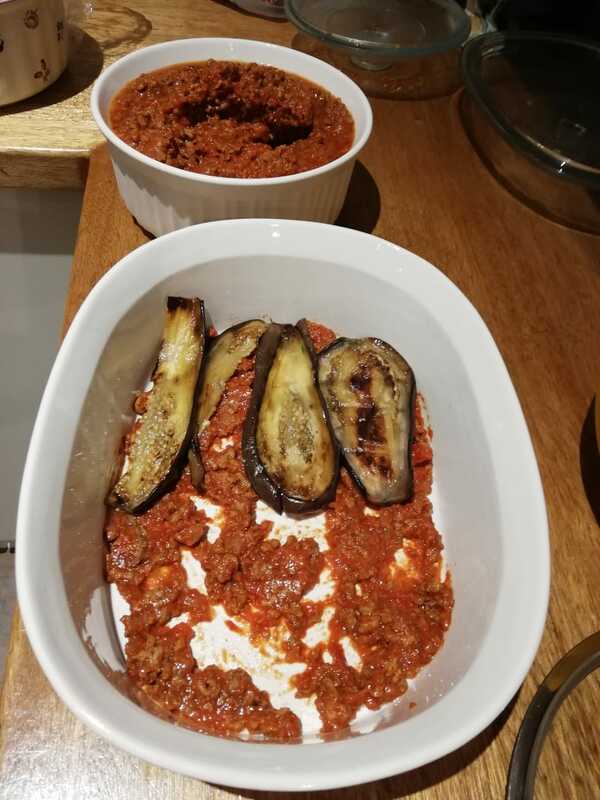 Take you tin from the fridge and fill with the cream cheese mixture, cover with cling film and then back into the fridge for at least an hour or two. Top it with whatever makes you happy. Berries are a perfect match but try something different as well. Matt could not stay away! I just had to repost this today, they are really easy and are brilliant as a dessert to impress visitors during the Xmas season. They do take a bit of time but is so worth it. These have got to be the ultimate weakness of almost anyone. 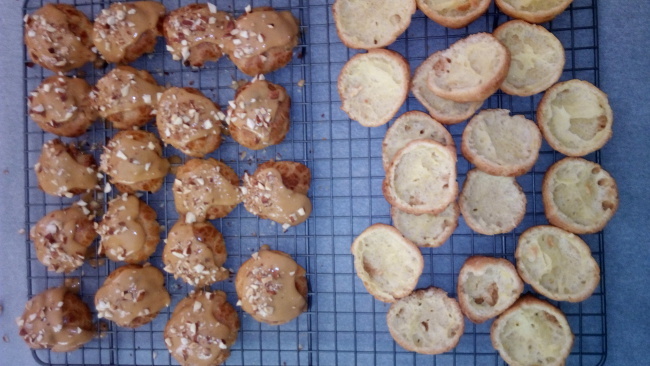 Choux pastry is not difficult to make, it just seems like it’s not working while you are mixing and then suddenly comes together. It’s important to follow the instructions exactly and weight/measure the ingredients. You will have no problem and can tell you people will want them over and over again. 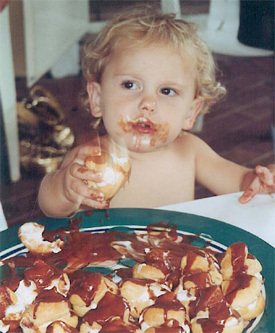 This photo is of my youngest son some years ago which tells the story. Thois makes 25-30 bite size profiteroles. Heat the water on medium for the chocolate sauce and break the chocolate into the water, sitr until all of the chocolate is melted. Remove from the heat and set aside to cool. Heat the oven to 200 Celsius with the rack in the center of the oven. In a pot, add the water and butter and heat on medium high until the butter has melted and is just boiling. 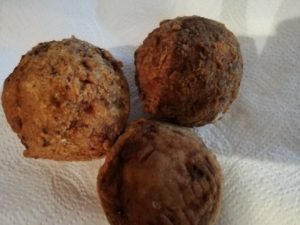 Remove from the heat and immediately add all of the flour and mix until the batter forms a ball and starts to pull away from the sides of the pot. Let it cool for about 3-4 minutes. While it is cooling break the eggs and beat lightly in 2 seperate cups. 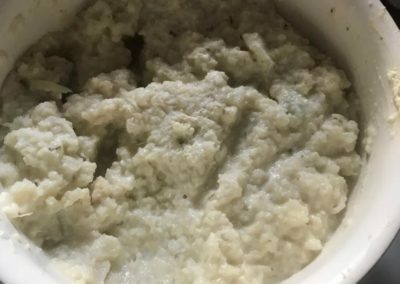 Add 1 egg into the mixture and mix well with a wooden spoon (this is where it seems strange, the batter will seem to separate and it has a strange loose texture – keep mixing) until it comes together. Add about 1/2 of the next egg and follow the same process until the batter comes together, add a little more egg and repeat. The batter must be smooth and shiny and just drops off the spoon when lifted but maintains it’s shape. If you have a piping bag, use a large nozzle and pipe 2-3cm high rounds onto the baking trays. Alternatively place teaspoons of the dough onto the baking tray. space them about 2-3cm apart, you should end up with about 25-30 little mounds. 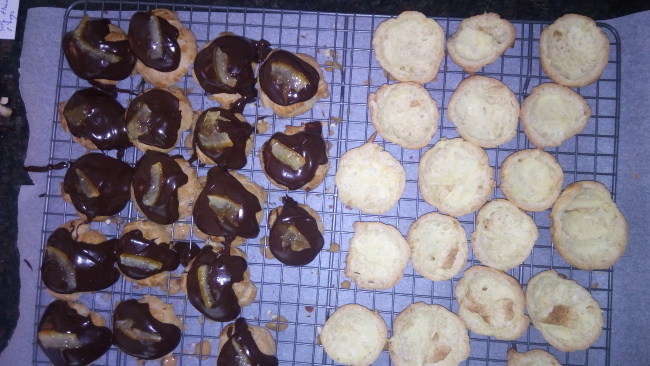 Remove from the oven and pierce the base of each profiterole with a knife to allow the steam to escape and place back into the oven for another 15 minutes to dry out and crisp up, then place them on a rack to cool. Once cooled, slice the profiteroles in half, fill with whipped cream and spoon over the chocolate sauce. Caramel with roasted chopped almonds and filled with cream and another dollop of caramel. Since my trip to Australia 2 years ago where banana bread is part of Ausie culture and can be bought anywhere! 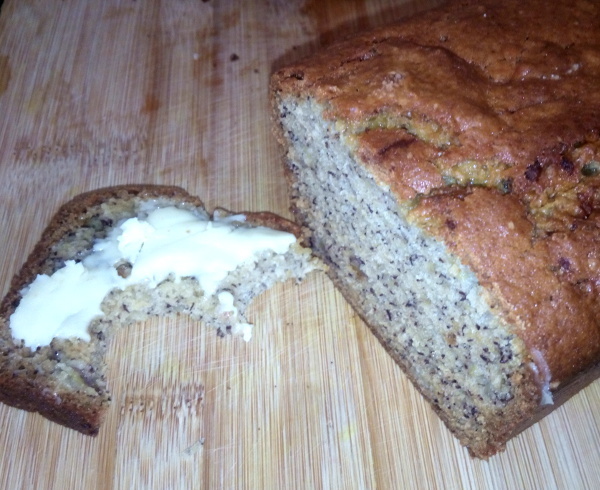 I have tried many banana bread recipes and am happy to say that this recipe is the easiest and tastiest of the lot. I have been making it regularly, cutting thick slices and smearing thick layers of butter onto warm pieces 🙂 If it’s not directly from the oven, I pop it in the toaster to warm it up. This is such an incredibly easy and satisfying recipe, you will be making it all through the holidays, having it for breakfast and for tea and perhaps even as banana french toast! You need a 20cm x 10cm loaf tin, it takes 10-15 minutes to prepare and 1 hour in the oven. Use a potato masher to mash the bananas well. You want a paste consistency with as few lumps as possible. add the sugar, egg and butter and mix well. When you can feel the sugar has dissolved (about 1 minute of mixing) put aside. In another bowl add the flour, salt and bicarbonate of soda (baking sode). Give it a mix with a fork to distribute the ingredients and then pour the flour mixture in with the banana mixture. Give it a mix until all of the flour is mixed in, pour into a lightly buttered loaf tin (10cm x 20cm) and then into the oven for 1 hour. Thats that! Your family will be so happy you tried this recipe.